And sometimes, when I'm feeling brave and/or particularly chubby, I even brush off the ol' jogging stroller for a spin. Although I often live in fear of hitting a rock and sending both of us flying, it's always fun to feel like one of those fit moms who actually uses her jogging stroller for a change. Now, however, as I'm gearing up to have baby No. 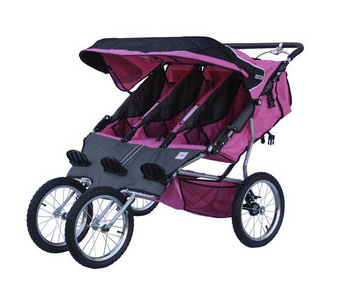 4 in a few short weeks (OK, so it's more like two months... ), I've had my eye on some of the cool double jogging strollers out there as well. But where to start even shopping for a jogging stroller? To update me on some of the new features of jogging strollers since I first bought mine at a garage sale six years ago (ahem), I turned to professional baby product reviewer Vanessa of Nessa Knows Best, who was kind enough to share some of her favorites with me. "This stroller is BRAND NEW to the market," comments Vanessa. "And it can be used as a travel system or an everyday stroller." 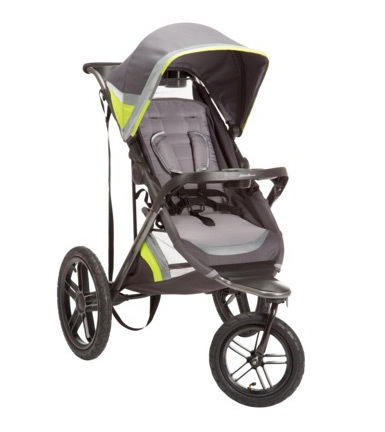 According to the BOB website, this stroller is meant for heavy outdoor use and has hand-activated rear brakes to help you tackle any steep hills when jogging or hiking. It also comes in three cool colors — green, black or orange. Personally, I like that it's a double stroller that has a front wheel that can swivel but also lock if you need to, as well as a canopy and an under-carriage storage area. This version is also available as a single stroller. (REI, $568). 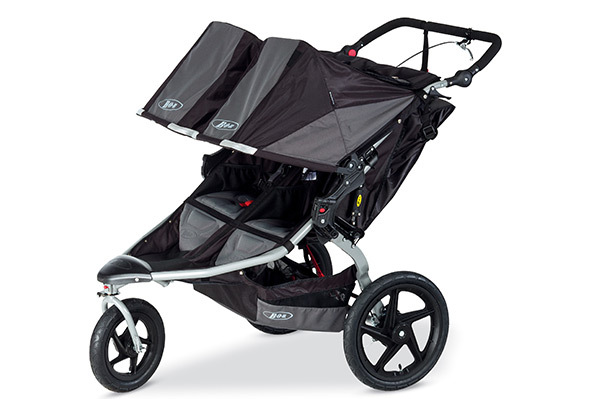 This stylish jogger nabs Vanessa's pick for the best single jogging stroller on the market. Although it comes with a pretty hefty price tag, she says that it's perfect for serious outdoor enthusiasts, as it is "great for hills with the hand brake, it can be pumped like a bike." And according to its product description, this stroller can easily shift from jogging to strolling with "all-wheel suspension." Are we talking about a stroller here or a car? One of the coolest features about this stroller is that you can literally fold it with one hand, using only a strap. Seriously handy. (Get it?) Oh, and the weather canopy boasts UV 50+ sun protection. (Baby Jogger, $430). Well this is one stroller that you probably haven't seen yet — it's a stroller, a jogger and a bike trailer all in one and honestly, it looks awesome. We love loading our kids up to take bike rides, and I've often lamented to my husband when yet another one of my crappy garage sale strollers would break down, "Why can't I just push the bike trailer around??" As it would turn out, someone else thought of exactly that — and created this nifty contraption. 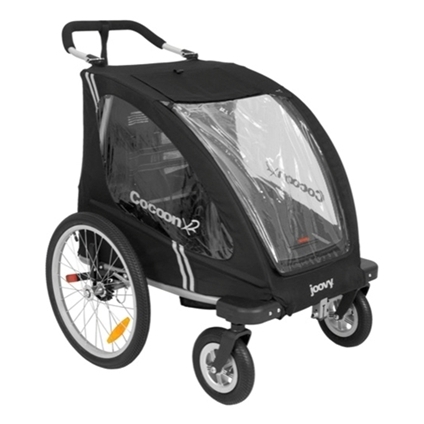 The CocoonX2 has a mesh cover, 5-point harnesses that can fit two children comfortably (max weight of 100 pounds) and adjustable handlebars so both you and your partner can push the stroller. When you're ready to jog with it, you can switch out the swivel front wheels for a fixed jogging wheel (that's sold separately) so you don't go crashing into the bushes. Also available in a single and in multiple colors. (Joovy, $550). 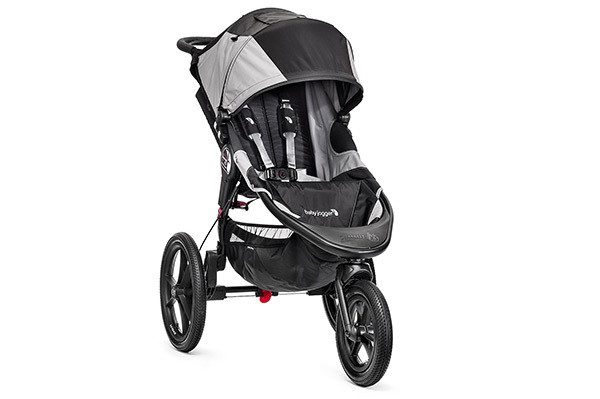 For those of us on a more limited budget, check out the Eddie Bauer Endurance jogging stroller, which is available online at Target. It's a nice mid-level priced stroller that is still sturdy enough to withstand real jogging, even on a dirt road like mine. It has a lockable front wheel that also swivels, meaning you could use it for everyday pushing as well. It has great reviews and promises a smooth ride with all-terrain air tires. (Target, $190). 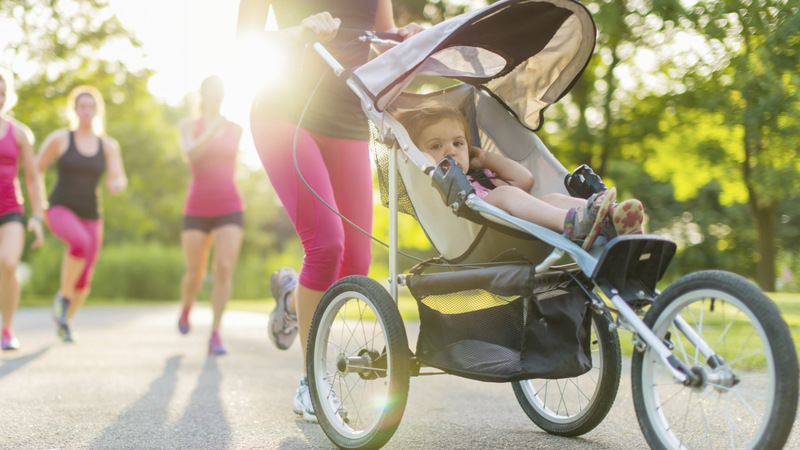 On the off chance you're crazy enough to seek out a triple jogging stroller like yours truly is doing, the BeBeLove Triple is one of the most affordable on the market. It has all the features you need for jogging, including a fixed front wheel (but be warned: you can't unlock it), foot and hand brakes and 5-point harnesses. I've also had some serious luck scouring used baby gear sites, like eBay and Craigslist, for this big-ticket item. It's one of those things that you can find in fairly good condition, because somehow parents don't end up using it as much as they thought they would... crazy, right? (Walmart, $540).